Phosphorus and potassium for flowering plants in Hydro and Coco plant systems. Flowering plants need more and more phosphorus and potassium. 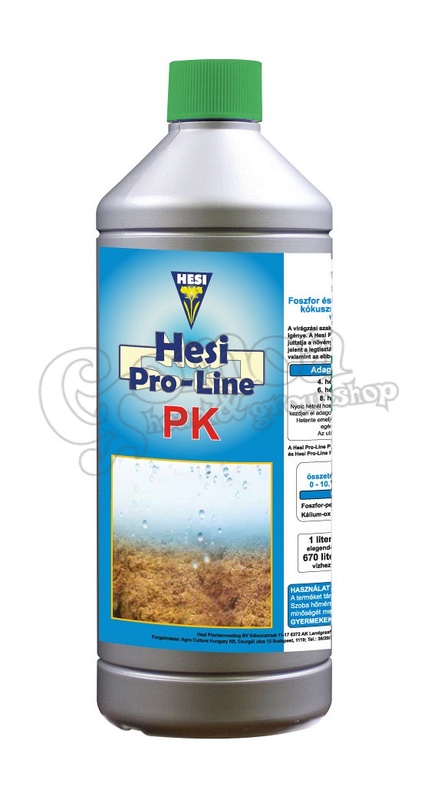 Hesi Pro-Line PK adds the correct dosage at the right time. HESI quality means: the purest ingredients, no fillers and therefore no residue. With flowering periods over 8 weeks, start at half of the period with 2,5 ml/10 litres Pro-Line PK and increase the dosage to 15 ml/10 litres in the next-to-last week. Rinse with water in the last week. Hesi Pro-Line PK is being used in combination with Hesi Pro-Line Coco and Hesi Pro-Line Hydro Bloom.